HIV & AIDS Information :: World AIDS Day - What is World AIDS Day? World AIDS Day takes place every year on 1 December. It provides an opportunity to draw attention to the HIV epidemic around the world. 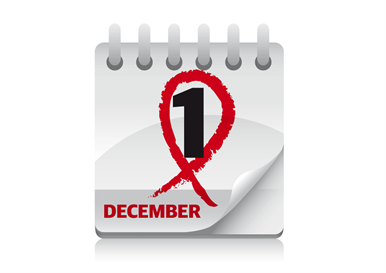 Many people choose to organise an event on or around December 1st, to raise awareness of HIV, to remember loved ones who have died, to show solidarity with people living with HIV, to celebrate survival and health, and to raise money for HIV and related causes. For many people the day is associated with the red ribbon, an instantly recognisable symbol. Wearing a red ribbon is a simple way to show your support, and there are also many other ways in which you can get involved. Every year there is a theme for World AIDS Day. 2018 is the 30th anniversary of World AIDS Day and the theme is 'Know your status'. The campaign is about "raising awareness about the importance of knowing one’s status and calling for the removal of all barriers to accessing HIV testing." Individual countries can also choose to interpret the themes in their own ways. The UK's National AIDS Trust (NAT) produces a World AIDS Day website and materials each year. This year, NAT's campaign is 'Rock the Ribbon'. You can read more about what's happening on World AIDS Day in the UK on NAT's World AIDS Day website. But if you're planning an event, you could choose your own theme or message. We rely on our supporters. There are lots of ways you can support us, all of them valuable.